107 Avenue west of 130 Street widens out to a standard 4-lane arterial road with significant landscaped boulevards on each side of the street. This section of the project is a major commuter route for Edmontonians accessing the downtown and the University of Alberta area. An August/September 2013 online survey had 315 respondents with about 50% from the communities of Westmount, Glenora and North Glenora. 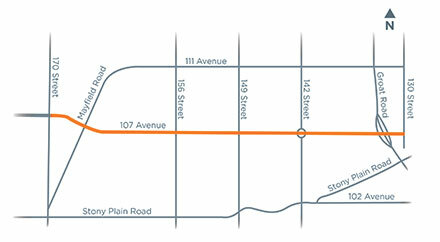 Following the separation of project limits as a result of public input and stakeholder consultation, the project team updated the assumptions used in the technical analysis of the 107 Avenue corridor to ensure that the plans for the future 107 Avenue would accommodate the needs of area businesses, residents and commuters. These updates included using the latest information about land use and traffic volume projections, as well as updating pedestrian connections along the corridor. Access ways and traffic pattern changes were also reviewed in conjunction with the planned Valley Line LRT. A draft concept plan of the 130 Street to 170 Street portion of the 107 Avenue corridor was presented at a March 3, 2015 Open House. A recommended concept plan is now available. The City of Edmonton held an Open House to present the draft concept plan for improvements to 107 Avenue, between 130 Street and 170 Street. Below is the information presented at the Open House. The project team reorganized the 107 Avenue concept planning project and have advanced one section of the project to the next stage of development. The fall 2013 online survey and interviews with community stakeholders revealed a split in traffic concerns for the corridor. Citizens east of 130 Street had concerns with on-street parking, neighbourhood parking and unsignalized pedestrian crossings. This section of the roadway is very narrow, with businesses abutting the street; additional analysis will better determine the required improvements to this corridor. West of 130 Street there is no on-street parking; instead, issues related to traffic delays, congestion, and concerns with pedestrian/ cycling connections and safety were identified by the public as major concerns. Following the survey, the project team undertook significant traffic analysis of the entire corridor, considering updates to population and employment projections, land use plans and future traffic changes as a result of the planned Valley Line LRT. The analysis included a review of the number of lanes required, pedestrian and cyclist accommodation, and looked at the advantages and disadvantages of widening the corridor. As a result of this analysis and the divergent nature of the public’s concerns, the project has been divided into two sections. A compilation of all the feedback from public involvement events. The City conducted an online survey and 315 area residents, business owners, commuters and representatives from community group shared their impressions of travelling along 107 Avenue from 109 Street to 170 Street. People who visit the area for recreation and shopping were also significantly represented in the survey results. Of the total respondents, 84% had some transportation concerns about the 107 Avenue corridor including many of the concerns listed in the project summary above. These concerns will guide the development of concept plans for each portion of the roadway.